The month of September turned out to be a busy one for Power BI. We were honored to have presented in a number of sessions at Microsoft Ignite and met some of you in person. A big thank you for those of you that attended. For those who could not make it, no worries, you can always check out the recordings of the individual sessions. We hope to see you next year! We want to make it as easy as possible for customers to adopt Premium for their existing Power BI deployments and start benefiting from unlimited distribution to all users, consistent performance, and increased scale. 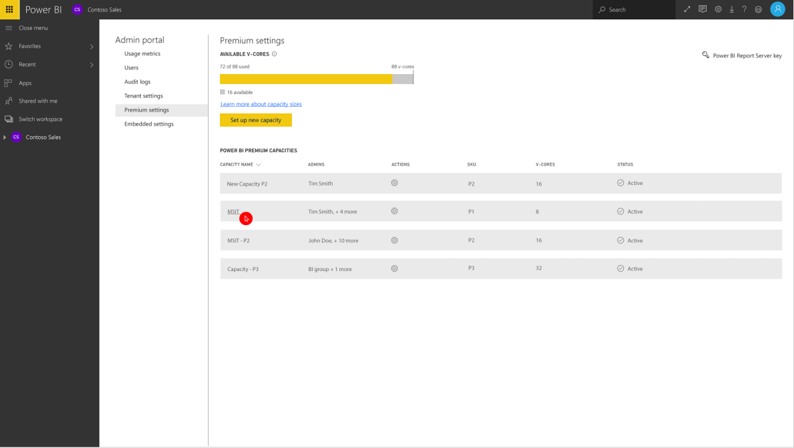 While Power BI apps are the recommended approach for large scale distribution, we heard that some customers wanted to use their existing dashboard sharing approach so they could adopt Premium more quickly. As a result, we now allow dashboard sharing by Pro users of content in Premium workspaces to all users. Apps continue to be the recommended way to distribute BI content to large groups of users and we encourage customers to consider apps in their deployments. Apps include features that make content distribution easy to manage including staging of changes, managing permissions for all reporting assets in one place, and a streamlined consumption experience for users. For more information, see this blog on Power BI apps. 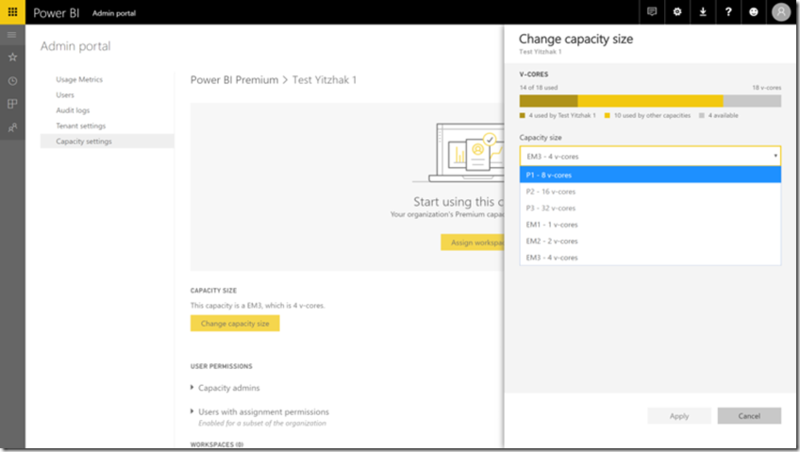 When Power BI Premium was first announced in June, we required you to choose between four different SKUs (EM3, P1, P2, P3), each which contained different numbers of virtual cores and memory sizes. This month, we released a set of features that give you much more flexibility on how you can allocate capacities and deploy Premium within your organization. The first feature is v-core pooling, and here’s how it works. When you purchase a Premium SKU, you will gain access to the corresponding number of v-cores. For example, if you bought a P3, you will have access to 32 v-cores. By leveraging v-core pooling, you will have the flexibility to provision the v-cores into one or more nodes of Premium capacity. With the same example, you can use your 32 v-cores to provision four P1s (4 nodes * 8 cores/node), two P2s (2 nodes * 16 cores/node), or just one P3. You are also free to move between the different node configurations as long as you have the v-cores available. Learn more. As part of the v-core pooling release, we are also making it easier for you to scale-up or scale-down your premium capacities with just one click! If you have a P1 node, for example, you can now scale that up to a P2 or P3 though the capacity admin portal, provided that you have purchased the required number of v-cores. Conversely, you can scale down a capacity to a lower SKU to free up your already purchased v-cores for another node. Last week, in partnership with PubNub, we announced availability of a PubNub Block for easily pushing data into the Power BI REST APIs. PubNub Blocks provide serverless functions which can be easily set up at a moment’s notice. With the Power BI push dataset block, users can easily push data from PubNub streams to the Power BI REST APIs. From there, the data can be visualized in real-time as a Power BI streaming dataset. Read more about streaming datasets in Power BI and the PubNub block. We continued to make enhancements and shipped a new update for the Power BI On-premises data gateway. The update includes Personal Mode support for national clouds, improved data gateway configuration experience when running Personal Mode, and a new version of the Mashup Engine. Try it out for yourself by installing the new gateway and continue to send us feedback on any new capabilities you’d like to see in the future. At the beginning of this year, we introduced support for reports on mobile, which allowed authors to seamlessly create report views optimized for a phone’s form factor. This month, we are taking it one step further and making your report exploration even more powerful by announcing filters on phone reports! You can now gain full access to all the filtering capabilities available to you in the service on your phone – with no further configuration needed. All the various levels including: report level, page level or visual level filters on the original report will automatically appear on your phone’s report in a touch optimized interface. Just like on the service, you can choose to use basic or advanced filtering, while having the default filtering set saved by the report author propagate to your mobile app. The Power BI team recently announced support for a new type of visualizations – Visio visualizations. This new visualization allows you to create tailored charts without the need to code! Once created and added to your report, all report viewers will be able to view and cross filter it across all platforms – including all mobile platforms. Last, but not least, this month we rolled out a batch of performance enhancements and optimizations to usage metrics for reports and dashboards. As a reminder, earlier this year we debuted usage metrics for dashboard and report authors and also improved usage metrics with per-user data last month. With this newest update, usage metrics reports now load many times faster, allowing dashboard and report authors to get even quicker insights into their impact. Learn more about usage metrics.